The first PCRecruiter update of the new year is here! Our development team has now shifted to a more rapid deployment schedule, which should mean smaller, more frequent update releases than we’ve had in the past. Check out the overview video and read on for more below. Immediate live posting on SEEK – no wait time for candidates to see your jobs. Edit and Delete jobs straightaway. We’ve also added direct integration with LogicMelon, which allows recruiters to post jobs to multiple destinations, including 2,000+ job boards, social media sites,and niche sites. Track all of your posting activity in one centralized location. Our integration allows job and candidate information to flow seamlessly and creates a single solution for a recruiter’s needs. For more information, visit LogicMelon. PCRecruiter Canvas is where our product development team can present ‘sketches’ of potential projects under consideration, allowing us to ‘canvas’ you for feedback. By getting PCR users’ input earlier in the process, our team can better define projects, or make decisions about which ones ought to be developed at all. Look for the first Canvas posting later this week! As part of our broader effort to better communicate with our users about new or proposed changes and features, we’ve created a notification banner that will appear whenever you log into PCRecruiter if there are feature updates (like this one) or PCR Canvas postings that you haven’t seen yet. If any new feature postings or PCR Canvas postings are available when you log in, the banner will appear. You can either click on the banner to review the new posting, or click the ‘Close’ option to dismiss the banner. If you neither view nor dismiss the banner, it’ll appear every time you log in until you take some sort of action. You can always get to the latest feature postings from the PCRecruiter login screen or directly on our blog. The notification banner checks for features or product update postings will appear on a ‘once per day’ schedule until you have either viewed or dismissed the most recent two update notices. PCR Canvas postings will appear on a ‘once every five days’ schedule until you have either viewed or dismissed all queued PCR Canvas postings. 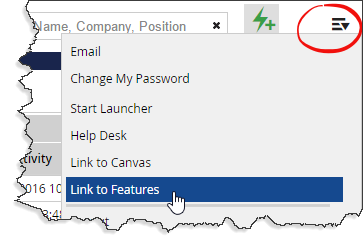 Once you have dismissed or viewed all postings, you can still get back to them via the small launch menu at the upper right corner of your PCRecruiter main menu. I like the new features and I am curious about logic melon and I am wondering what job boards to they post to in United States and Canada. Another great enhancement to top notch customer service. I like the transparency of the rollouts. Looking forward to chiming in. There are lots of ideas I have as I use PCR which could make it easier, so will be fun an useful to have a way to chime in. Can you please tell us if this is an automatic update or is there a charge for this? Main Sequence offers these integrations at no cost. The fees involved in the postings themselves would be directly from SEEK or LogicMelon respectively at the rates they define for your account.